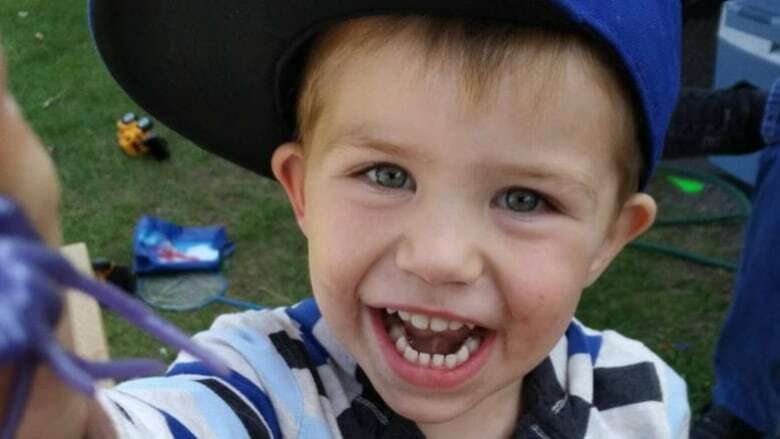 Michelle Hanson, the mother of Kaden Young who was swept away in the Grand River in February after their minivan went into the water during flooding, has been charged with impaired driving causing death. The mother of a three-year-old boy who was swept away in the Grand River during flooding in February has been charged with impaired driving causing death by Ontario Provincial Police. Michelle Hanson, 35, who lives in the Southern Ontario township of Amaranth was in a minivan with her son, Kaden Young, on Feb. 21 when she went around a road closure sign, police said. Water was over the road, about one kilometre from their home, and the minivan wound up in the Grand River around 1 a.m.
As they exited the vehicle, Hanson lost her grip on her son and he was swept away in the river, police said. His body was recovered April 21. Hanson is facing charges of impaired driving causing death, dangerous driving causing death and criminal negligence causing death. She's due to appear in an Orangeville courtroom on Nov. 6. Dufferin OPP Const. Paul Nancekivell said officers went to Hanson's home Thursday morning and she agreed to come to the detachment. When she arrived around 12:30 p.m., she was arrested on the three charges. He said he could not say whether police believed Hanson was impaired by alcohol or drugs "because we're worried about the integrity of the investigation." He added the difference between the second and third charges is that dangerous driving "is when somebody's life is endangered by dangerous driving and when you drive past road barricades and around road closures signs, you're endangering somebody. "Criminal negligence causing death, anybody who's responsible for children has an obligation not to be negligent in their care. And by driving around those barricades and him dying, that's basically the last [charge] as well." In a release, Dufferin OPP said, "The OPP sympathizes with and expresses its heartfelt condolences to the family of Kaden Young on his tragic loss. 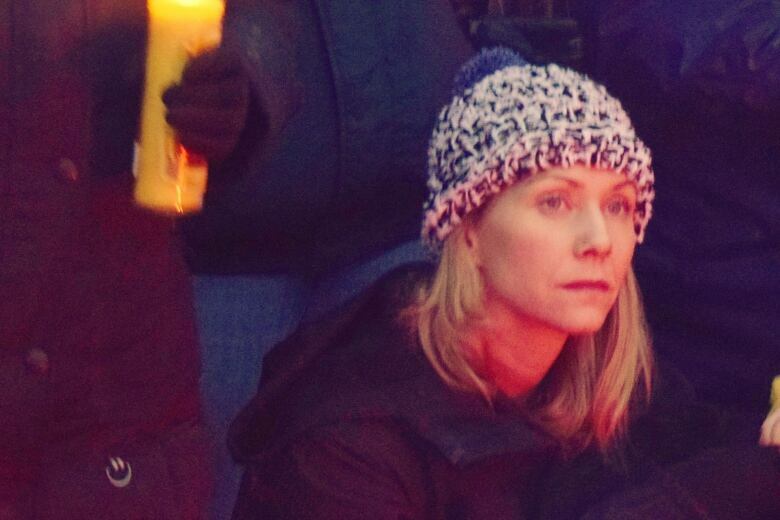 "We also remember and recognize the many community residents and visitors who gave of their time to search for Kaden during the aftermath of this tragic incident." In the two months the boy was missing, hundreds of people searched for him along the banks of the Grand River. Richard Croft, a local tow truck driver who heard the call to emergency services the night the boy went missing, organized grid searches to cover as much ground as possible. In March, he said people came from across the province to volunteer, including over the Easter weekend. "We're not just a community now, we're family," he said of the volunteers. "[Kaden's] just an amazing little boy. We've got to bring him home." Township of Amaranth Mayor Don MacIver said at the time the support from the community to find Kaden was incredible. Kaden's father, Cam Young, and friends of the family declined to speak to CBC News on Thursday. Nancekivell​ said the case "gripped the community" as well as officers investigating the case. He was there the day they found Kaden's body near a bridge just north of Belwood Lake. "It was tough. We were fortunate the OPP provided good mental health counselling for us and some of us had to take some time off and rest up and reflect a bit and then come back at it. It's not an easy job sometimes and nobody wants to find anybody dead, let alone a little child," he said. In an earlier version of this story, a secondary reference misidentified the last name of the mother. It has been clarified and corrected.